I look forward to buying others. I love being able to switch these garden flags out for the holidays and seasons. Ordered for myself and will use at Christmas. And winter time. I bought this product because I was looking for a mini flag for the Winter months, right after Christmas. So this will be on my front door from January until the new holidays of the year appear in the Spring. This is the second time I have purchased this pretty winter flag. The first time after I put it on display outside someone stole it. It's just the right size and looks so pretty I guess they couldn't keep their hands off it. I will most likely use this during the snow season here which is like all winter long. Very nice design. 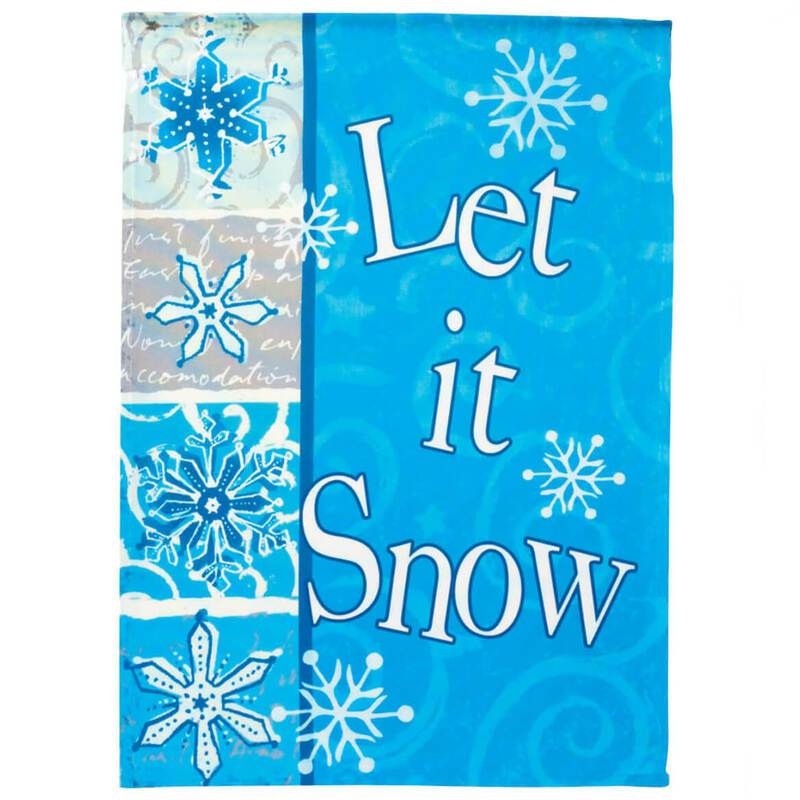 Great "Let it Snow Garden Flag"
I am thrilled with both flags that I ordered----perfect size and the material is what I expected. Glad I decided to order both garden flags. My outside CHRISTmas theme is let it snow & this flag in front of my porch looks awesome. We have a holder in our front yard to display seasonal flags. A really nice display of a multi-blue background with white snowflakes. I plan to display this flag in my front yard in January. As a native Floridian, I really wouldn't mind if it snowed occasionally, but I'm sure my neighbors will get a chuckle out of the "Let it Snow" wording on this winter garden flag. Really jazzed up my front yard. This flag is only printed on one side. The other side is basically blank. Everyone knows the wind blows these flags and the pole can turn, depending on the type of pole you use. Any garden flag I bought was printed on both sides. It was a pretty design for the upcoming winter season.. I wanted a garden flag to hang after Christmas. And I LOVE SNOW ! To use during the winter months. Something to brighten up the dull winter. Good Flag for January after the new year. I like the vibrant color that will be displayed in the dead of winter. It will be cheery to passing traffic, pedestrians and me!!! I needed a flag for the winter months. I like the blue color and snowflakes. EVERYTHING I EVER ORDERED WAS GOOD QUALITY AND ARRIVED ON TIME. Thought my daughter would like them. 1 of these for my four flag holders. love garden flags, and the price can't be beat! Love my garden flags. This one can stay up all winter! Wanted a flag for after Christmas and before Valentine's day. 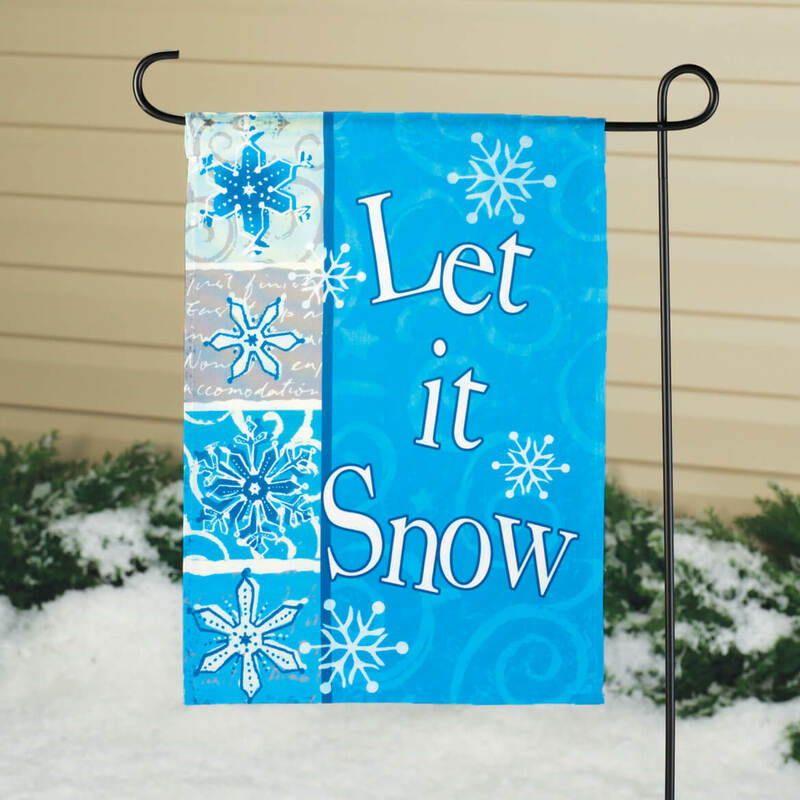 I always have 3 garden flags out all year round and I love snowflakes. Price was excellent. Liked that it can be used through the entire holiday season. For graves. We change the flags as the season changes. Are these flags printed only on one side? BEST ANSWER: Thank you for your question. It is printed on one side only. We hope this information will be of help to you. I want a Christmas and Fall flag but I want 12 1/2 x 21. Do you have any? BEST ANSWER: Thank you for your question. Unfortunately, our garden flags are 15" long by 11" wide we do not have larger sizes. We hope this information will be of help to you.